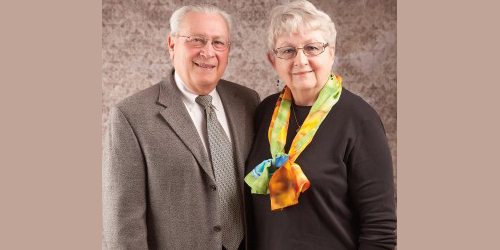 James '63 and Ginny Van Lew '63 Beck say their liberal arts education gave them a foundation for life, shaping their work, church life, parenting and community participation. "We wouldn't trade our time at Westmont for anything," Ginny says. Jim majored in history, earned two master's degrees (in education at Oregon State University and theology at Dallas Theological Seminary), and completed a doctorate in psychology at Rosemead Graduate School of Psychology. A former Christian educator and pastor, he founded Valley Psychological Center in Sacramento, California, where he worked as a clinical psychologist. He jumped at the chance to teach at Denver Seminary so he could combine his interests in psychology and theology. He studied mental health on the mission field, especially for missionary children, and his seven books include "The Healing Words of Jesus," "Helping Worriers," "Jesus and Personality Theory," "The Psychology of Paul," and "Two Views on Women in Ministry." Both the Becks possess a long-term passion for helping and encouraging women to use all their gifts and participate in ordained ministry. An amateur historian, Jim has written about homesteading in Kansas, where the couple retired in 2006, and he volunteers at the local historical society. Ginny grew up spending summers with family there, a practice she and Jim continued. Ginny majored in elementary education, spent three years with Head Start, worked in public relations at Denver Seminary and taught in the Denver public schools. They raised two children and have six grandchildren. Since retirement, they volunteer, garden and maintain their 80 acres, and travel throughout the world. When the Becks sold their farmland at public auction, they used the proceeds to create a charitable remainder trust with Westmont, which provides them with income for life and substantial tax benefits. They were recognized as Wallace Emerson Society members, and upon their death, the residual funds will be added to the college's endowment. "The need for liberal arts education is greater than ever," Jim says. "We think supporting Westmont is the best investment in the future and will benefit students, society and the church. The liberal arts taught us our way of thinking wasn't the only way to think, and we've been grateful for that for more than 50 years." Reproduced with permission from the spring 2014 issue of the Westmont College Magazine. To learn more about using appreciated property to establish a charitable remainder trust, please contact the Office of Gift Planning at 805-565-6058, or giftplanning@westmont.edu.